The largest tract of old-growth bottomland hardwood forest left in North America can be found in this swampy national park. Rivers sweep through the floodplains, and great bald cypress trees make up one of the highest deciduous forest canopies in the world. Hiking the 2.4-mile boardwalk loop is a great way to get to know the park. While hiking the loop, visitors will get get to see first-hand the effects Hurricane Hugo had on the park. Floods and hurricanes are vital to the park’s ecosystem, creating nutrient-rich soils and providing opportunities for regrowth and regeneration. Interestingly, the Weston Lake, which can be viewed from this trail, was once not a lake at all. More than 10,000 years ago, the lake was a bend in the Congaree River, but was cut off once the river changed course. The park’s longest hiking trail is the King Snake Trail. This takes visitors on an 11-mile journey through some of the most remote parts of Congaree National Park. Hikers will encounter a cypress-tupelo slough and huge cherrybark oak trees. Canoeing and kayaking is the most popular activity in the park. The park offers some free guided canoe and kayak tours throughout the year. Canoes are provided for tour participants, but other than that the park does not provide canoe or kayak rentals. On the water it is easy for visitors to see the beauty of the forest canopies draped with Spanish moss. A popular water trail is Bannister’s Bridge to Cedar Creek Landing. This trail leads paddlers through narrow and twisting low-brush forest out to more open waters past mighty oaks and loblolly pines. Visitors should allot four to six hours for this paddling adventure. Fishing in the park is allowed in the park, but requires a South Carolina fishing license. Except for Weston Lake, fishing is allowed in all park waters. The park encourages recreational fishing, so please practice good sportsmanship and release the fish back into the park’s waters. The park is open year-round. The Harry Hampton Visitor Center is the park’s only visitor center and is open daily except for Thanksgiving, Christmas and New Year’s Day. The park does not charge tour or entrance fees. If visitors plan on taking the Owl Prowl or a guided canoe tour, it is best to make reservations. Campgrounds are the only lodging options within the park. All camping requires a free camping permit, which can be obtained at the visitor center. The campground with the most amenities is Longleaf Campground, which features grills, fire rings, and porta-johns. There are eight sites. Backcountry camping is also available. All backcountry campers must remain at least 200 feet away from all backcountry trails and water, and at least 500 feet away from all park buildings. The park is home to an array of wildlife. Visitors can easily spot forest animals such as deer, opossums, raccoons and river otters. The park is also home to the endangered red-cockaded woodpecker. Once abundant in the southeast United States, its numbers have dwindled down to about 6,000 family units. These woodpeckers nest and forage in pine forests. With the number of suitable pine forests decreasing, it has become increasingly hard for these little birds to find suitable nesting sites. Regular forest fires help to maintain open forests and are crucial to its survival. The red-cockaded woodpecker prefers open forests with old pines for nesting. The park routinely performs prescribed forest fires. Congaree National Park is named for the Congaree Indians who inhabited the area before the arrival of European settlers. European settlers brought with them European diseases. By 1700 the Congaree Indian population had been wiped out by a smallpox epidemic. In 1969, high timber prices had many convinced that logging in the area should be resumed. The Sierra Club quickly stepped in with grassroots opposition campaigns and convinced the federal government to establish Congaree National Monument in 1976. The national monument was transformed into Congaree National Park in 2003. 1915 – Logging operations in the area cease. 1983 – Congaree National Park is designated an International Biosphere Reserve. 1989 – Hurricane Hugo hugely impacts the park. 1996 – The park’s cattle mounds are added to the National Register of Historic Places. 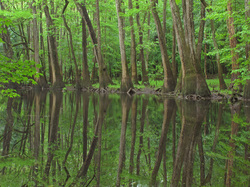 2001 – Congaree is designated a Globally Important Bird Area. Click to see a detailed Congaree National Park Map.